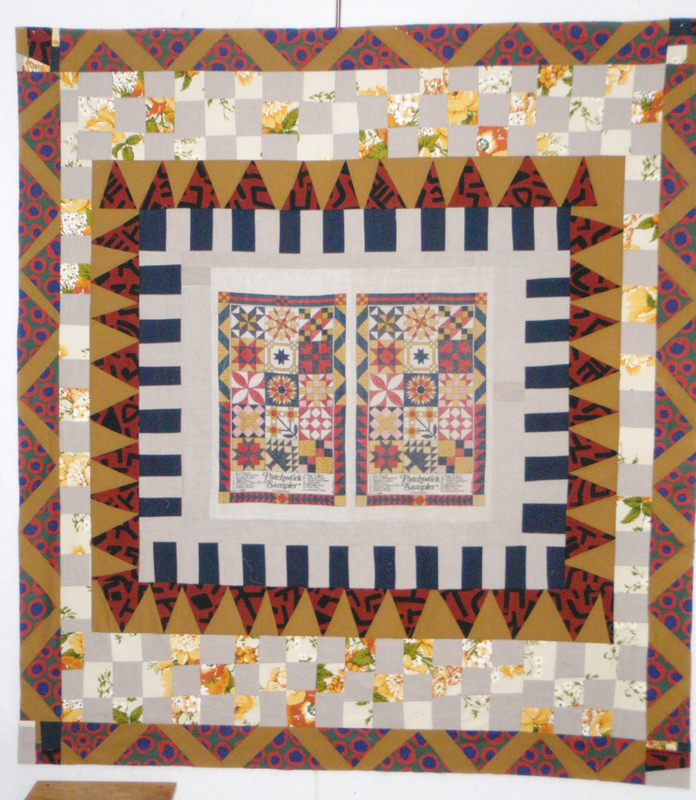 I spent a lot of time thinking about what fabrics I wanted to use in fourth pieced border. I felt I needed to repeat the gold fabric, but I thought the natural linen would be to blah. I just purchased a yard of the fabric with the rust circles and I thought the addition of another shape would work. I went back and forth in my head with using the navy with the gold instead, but I thought that would be too safe and too close to the border in the tea towel. So I went for it and here is the result. I decided to make some made fabric from the scraps and I used the made fabric as corner blocks. 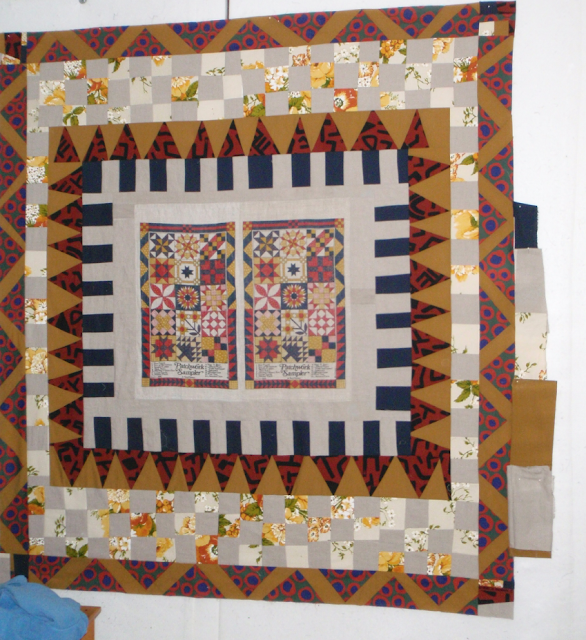 The quilt measures 71” x 78”. 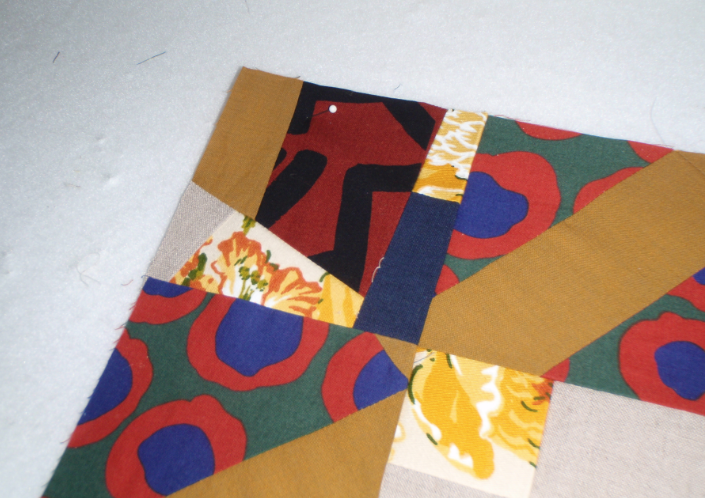 Since the last border is all bias cut fabric I am thinking about adding one more border using what fabric I have left cut on the straight of grain in random cut rectangular blocks. I pinned up some pieces to audition them. The more I think about this the more I feel that I need to add this last border. loving it! I need to work on mine! Wow, it's really looking great! This is turning out so cool. 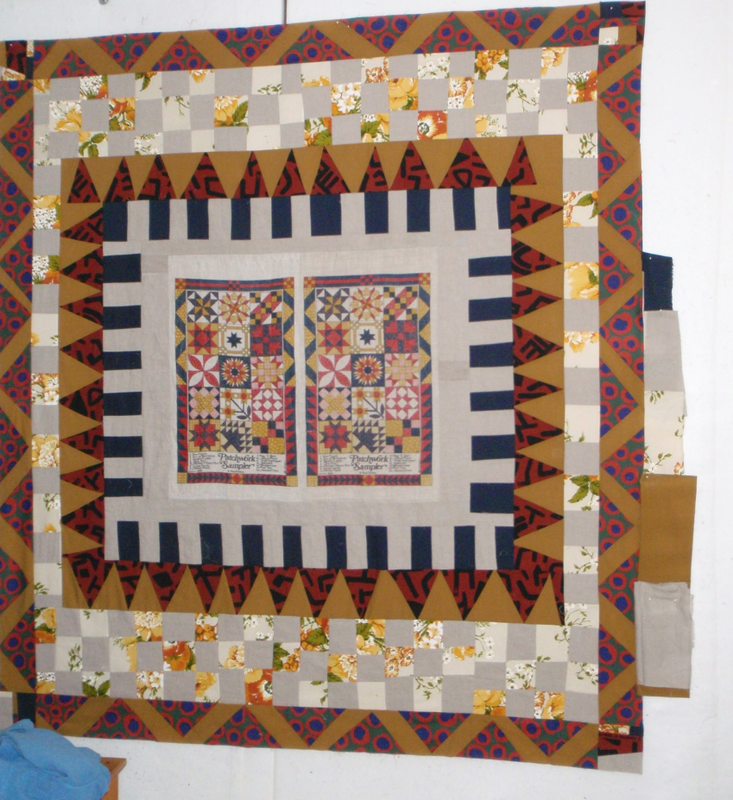 If you don't want to add that final border you can do a narrow stay stitch all around the edge before you layer and quilt it. I've even seen where some quilters do that when the quilt is layered and basted. If you are careful, you won't stretch the edges out of shape. Tip - when I have bias edges I secure them by ironing on fusible interfacing. Just use an up and down motion with your iron when applying the interfacing- it really does the trick. I love the play between darks and soft lights. Really pretty!